When hunting a deer, you can make the right decision within a few seconds if you know How To Age A Deer By Sight. There is a slight change in the body of a deer in different stages of its life. Some of the changes are visible but you need field experience to make a proper judgment. Most people look at the overall size of the deer, the legs, nostrils, the chest, and the pair of antlers. This tips can enable you to estimate the age of a deer with ease. If you are a professional hunter, you need to have skills for field judging deer. You need the following items to note down some important points that can make your hunting efficient. When hunting a deer, always position yourself on a higher ground. However, you should also stay downwind to avoid being detected since a deer has a strong sense of smell. Raised grounds can enable you to have multiple views of the deer at different angles. Furthermore, it is easier to shoot a deer from a raised ground. If you are wearing glasses or goggles, remove them so that you can get a realistic view of the deer. Glasses or can make the deer appear too big or too small depending on the magnification. This can lead to poor judgment and you may end up shooting a young one. However, a pair of binoculars is the perfect gadget to use for observing deer. You don’t need a guide on How To Age A Deer By Sight to spot a young one. Young ones have small bodies and they are shorter. Some of them struggle to walk on mashes and tall grass. They are usually protected by the cows from predators. In addition, they are extremely active and they keep running and jumping. You can easily age a deer that is one and a half years old. At this age, they have a relatively small body and their heads have a small set of antlers. The back of the deer has a sharp slope from the rump to the shoulder. In addition, their body appears to have masculine shoulders and the tarsal glands are slightly stained. Furthermore, their bodies have more weight on the back half. Many hunters who know How To Age A Deer By Sight claim that at this age, the deer has a sleek appearance with long legs. The set of antlers start to develop rapidly and they are usually about 16 inches wide. The body still tips backward but the belly is tight. However, the body appears slightly masculine with more mature attributes. In addition, it starts to develop a chest and the head is erect. At this age, the deer has more mature attributes which make field judging easier. They have a bigger neck with a little swelling. The body of the deer is more massive and it appears to tip forward. However, the shoulders and chest are much larger and more masculine. The sets of antlers are more impressive especially if there is enough food. The males have a high testosterone level and they are extremely aggressive especially during the rut. You might see injuries on the body due to frequent fights. Most of them die at this age since they always try to defend themselves from predators. This is because they tend to depend on their pairs of antlers for defense but they often lose the battle. At this age, the body of the deer appears balanced. However, it has more weight towards the head since the set of antlers are wide. You will notice that the tarsal glands are heavily stained. The stomach appears flat but the legs appear shorter due to a massive body. In addition, the neck and shoulder muscles appear as one mass. 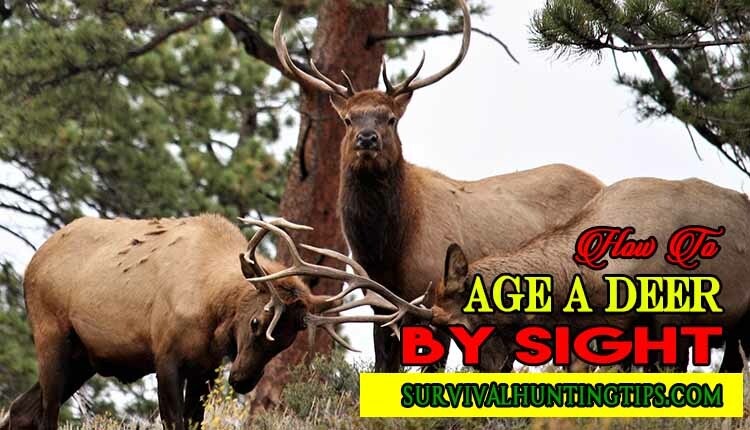 At this age, most hunters consider it to be mature and it is the appropriate age for harvesting. The necks of the Males swell significantly since the testosterone levels reach the highest levels. They are the most active during the rut and they try to get mating rights. The deer have some sag in the belly, the chest is heavier and the tarsal glands are heavily stained. The body will appear to be proportional from the rump to the brisket. Additionally, the brisket may slightly droop below the belly line. You will also notice an immense swelling of the neck muscles. The deer is fully mature and more experienced and hunting it becomes more difficult. It knows where to get enough food during various seasons, how to avoid traps and defend itself from top predators. It is difficult for a dear to reach this age. However, there are a few individuals that survive in the wilderness to their old age. At this stage, the weight of the deer drops significantly and it appears to be weak. The sag in the belly is extreme and there is a sway in the back. The legs appear too short for the body and there is an incredible neck swell. The small size makes most hunters to mistake it for a young deer. However, it has a unique nose which appears to be round. In addition, anyone who wants to know How To Age A Deer By Sight must always observe the tarsal glands. The tarsal glands of a deer that is more than six years old are extremely stained. Skills on How To Age A Deer By Sight are useful to hunters and those carrying out a field study. If you are a professional hunter, you can immediately shoot the animal and take it to a slaughterhouse. However, if you are a scientist who is carrying out a field study, the age of the deer is important. Categorizing the deer according to age can help you to generate a more detailed report. A deer undergoes different stages in life which change its appearance over time. The pair of antlers and the size of the body are the two main visible features of a deer. The appearance of a deer enables people to make field judgments with a high level of accuracy. However, if you want to make a proper judgment, you need to practice for some time. You should observe the deer using a pair of binoculars to see more features. It is advisable to write the main characteristics on a paper before trying to estimate the age. All hunters should know How To Age A Deer By Sight to prevent them from harvesting immature animals or young ones which is illegal. Additionally, tourists should also have the ability to estimate the age of a deer. Some males are highly aggressive during the rut and they should avoid getting too close since the animal can attack them.